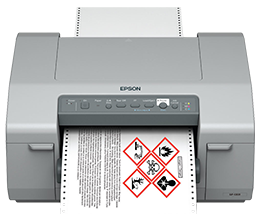 The Epson GP-C831 label printer makes printing your own durable GHS large format drum and chemical labels – and BS 5609 certified labels – a simple matter. This rugged label printer is the first BS 5609 certified inkjet label printer. With durable DuraFast Chemical Labels and the GP-C831 label printer, you can take charge of your chemical drum and harsh environment label printing needs. The GP-C831 color label printer is also a wide format label printer capable of printing labels as wide as eight inches across and 22 inches in length. Whether your labels will be exposed to chemicals or saltwater, it's no longer necessary to outsource your printing requirements. Do it in house and reduce your costs overall. This wide format Epson GP-C831 color label printer includes a high-speed USB port, parallel port, and Ethernet port to network your GP-C831 printer. It uses an 8-pin tractor feeder and is capable of print speeds of 16 and a half pages per minute. This is a rugged printer designed for heavy industrial use. With its MicroPiezo® inkjet technology system, the printer is capable of printing labels in beautiful 720 by 720 dpi resolution. The printer features pigment-based inks in individual cartridges for exceptional colorfast characteristics as well for minimizing ink waste. The Epson GP-C831 Color Label Printer accepts four separate ink cartridges: Cyan GJIC5(C), Magenta GJIC5(M), Yellow GJIC5(Y), and black GJIC5(K). Find great prices on Epson GP-C831 ink cartridges here. 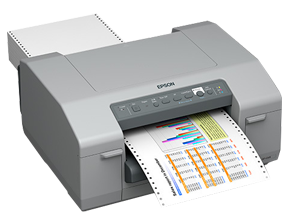 The Epson GP-C831 accepts a variety of blank labels and tags up to 8 inches wide. In addition to Epson GP-C831 matte, polypropylene labels, and high gloss label and tag stock, we carry GP-C831 BS 5609 certified Chemical labels designed to withstand the harshest environmental conditions. Our Epson CP-C831 blank labels arrive on 8-pin tractor feed sheets on rolls. Shop for blank Epson GP-C831 labels here. Can't find the exact size, shape, or material type for your label making needs? Let us custom make blank labels for you. Request a custom label quote today.